« Two great hackfest days! You might have noticed we’ve been fairly quiet of late. Well, that’s because we’ve been hard at work putting together a new website called Planning Alerts which we’re launching today. We’re really excited and proud to share this with you! You’d probably know if your next door neighbour was going to knock their house down (you’d get a letter through the door telling you they had applied for planning permission and asking you what you thought about it). But you’d probably never find out if the old cinema or pub 5 streets away is going to be converted into luxury flats until the bulldozers turned up. 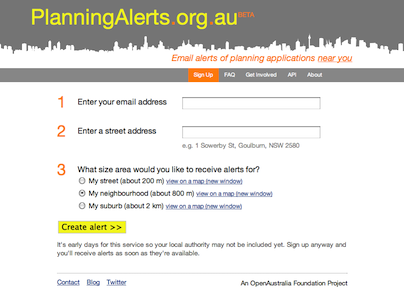 PlanningAlerts.org.au is a free service which searches as many planning authority websites as it can find and emails you details of applications near you. The aim of this to enable shared scrutiny of what is being built (and knocked down) in peoples’ communities. PlanningAlerts.org.au is brought to you by the OpenAustralia Foundation with financial assistance from the Australian Government 2.0 Taskforce. It was adapted for Australia by Matthew Landauer and Katherine Szuminska, and is based on the UK site PlanningAlerts.com, built by Richard Pope, Mikel Maron, Sam Smith, Duncan Parkes, Tom Hughes and Andy Armstrong. We’re not covering all the planning authorities yet. We’re nowhere near actually. We’ve started with the 50 or so authorities with the larger populations so we’re actually covering a good percentage of the country’s population. If you’re interested in adding a screen scraper for your local authority we’ve made it pretty easy for you. All the software that runs the site and all the screen scraper code is open-source, so please take it and have fun! How do I know you’ve completely understood where I say I am? If you’re not 100% certain, ask me to clarify, pinpointing on a map if necessary. This will stop users thinking they’ve sucessfully subscribed to receive alerts, whereas their associated address may not actually have any coverage (or its coverage may be unknown). 2. Feed support to complement email alerts. Gordon – thanks for your comments! This allows you to get a geoRSS feed based on a location and search size – either based on a latitude/longitude or street address.